The Urban Redevelopment Authority (URA) has launched a residential site at Clementi Avenue 1 for sale by public tender under the Confirmed List of 2nd Half 2015 Government Land Sales (GLS) Programme. This site can potentially yield about 460 residential units. The Land Parcel is conveniently linked to Ayer Rajah Expressway and Clementi Road, providing easy access to the city centre and the Jurong Lake District for residents. Residents will have easy access to educational institutions such as NUS High School of Mathematics and Science, Nan Hua High School, International Community School, Clementi Woods Secondary School and National University of Singapore. 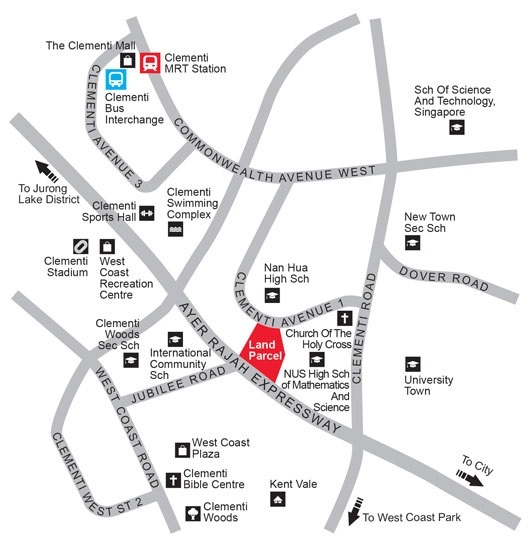 Residents can also enjoy recreational facilities at Clementi Sports Hall, which is within walking distance from the Land Parcel. Residents will also have easy access to retail and leisure amenities in the nearby Jurong Lake District, which is just one station away from Clementi MRT station. SINGAPORE: A residential site at Clementi Avenue 1 has attracted six bids, said Urban Redevelopment Authority (URA) said on Wednesday (Dec 9). The top bid came from a consortium comprising UOL Venture Investments and Singland Homes, which offered S$302.1 million. This translates to about S$6,620.21 per sqm. 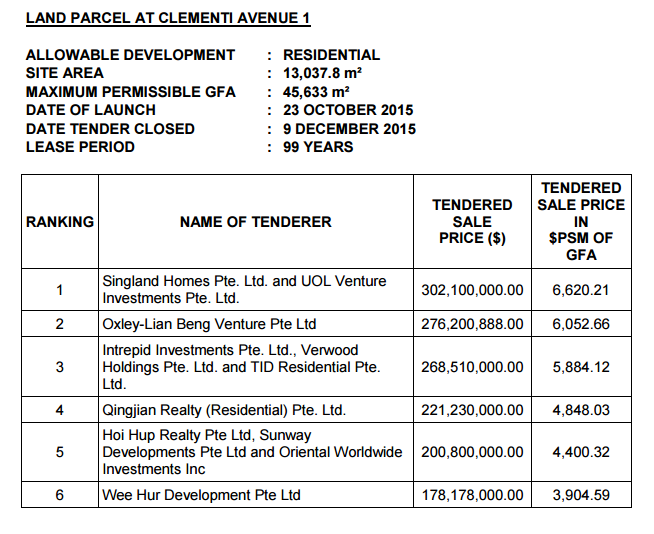 Oxley-Lian Beng Ventures was the second-highest bidder, at S$276.201 million. The 140,339 sq ft site can yield a maximum Gross Floor Area of 491,185 sq ft, or an estimated 460 to 500 housing units. Mr Desmond Sim, head of CBRE Research (Singapore and South East Asia) said the number of bids reflects the need for developers to beef up their land bank. Analysts estimate the breakeven prices for the residential space in the new condominium to be developed on the site to range from S$1,100 psf to S$1,150 psf.